Liam Fraser got a taste of poke yesterday from his mother, Dawn, who brought him to the 14th Annual Aloha Shoyu/Sam Choy Poke Contest at the Honolulu Country Club with his sister Solene, behind. Proceeds benefited the Kalihi-Palama Health Center. 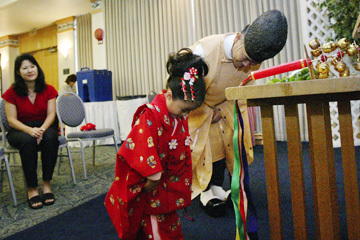 Three-year-old Aisha Yamamoto bowed yesterday with Shinto priest Daiya Amano of the Izumo Taishakyo Mission of Hawaii as her mother, Maxine, watched at a kimono dressing for Shichi Go San, a traditional Japanese coming-of-age festival, at the Japanese Cultural Center. Held around Nov. 15, the event is meant as a blessing for boys age 3 and 5, and girls age 3 and 7.